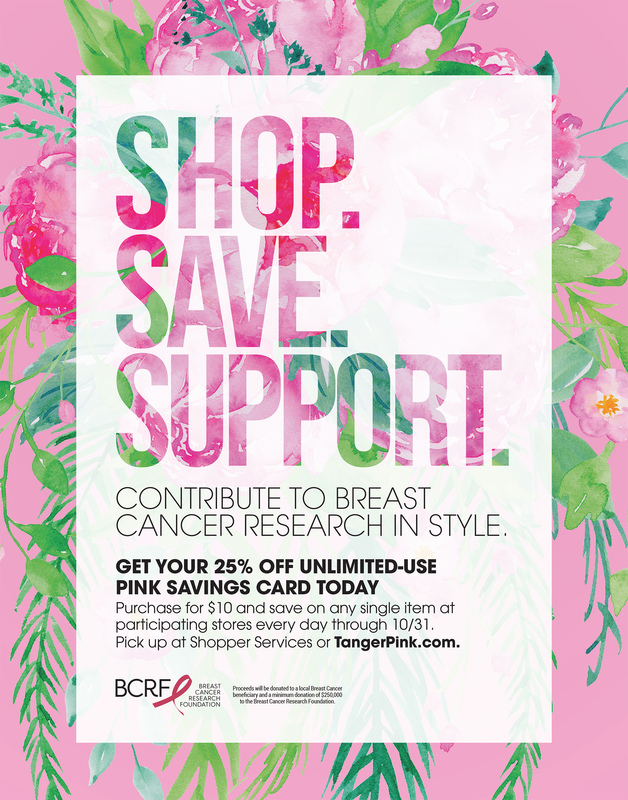 GREENSBORO, N.C., Sept. 26, 2018 /PRNewswire/ -- Tanger Factory Outlet Centers, Inc. announced today that in honor of the 25th annual Tanger PINK Campaign it will again offer shoppers great savings in return for supporting the ongoing efforts to end breast cancer during the month of October. 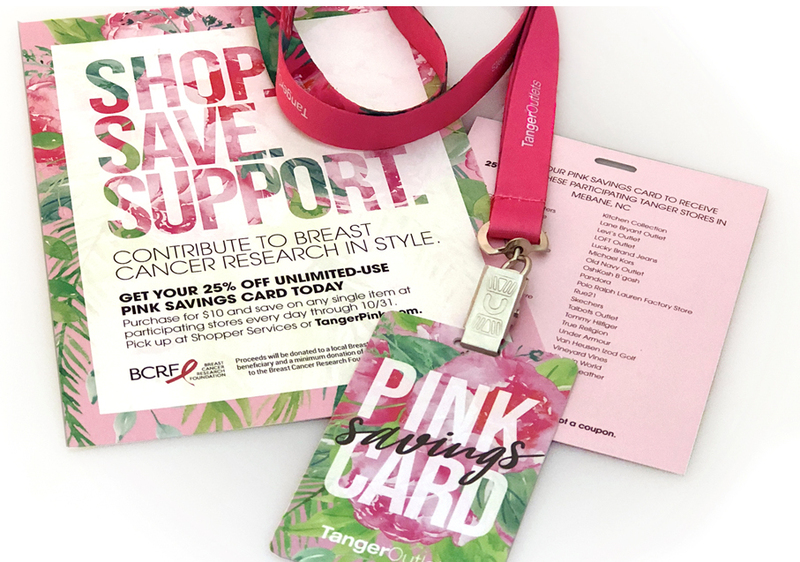 Launching today at Tanger Outlets across the United States and Canada, the Tanger PINK Campaign offers shoppers using the Shop Pink Card the opportunity to receive additional savings on the best brand name and designer fashions while helping to unite in the fight against breast cancer. "We are excited to continue working with the Breast Cancer Research Foundation and local organizations to support the fight against breast cancer," said Steven B. Tanger, Chief Executive Officer of Tanger Outlets. "We, along with our participating retailers, are committed to supporting the research that will one day lead to a cure for this disease that has impacted so many families." 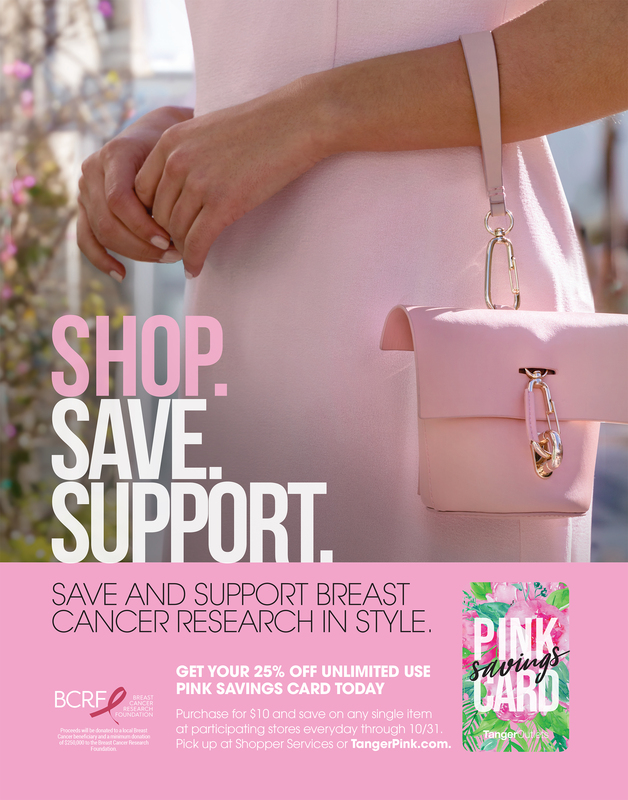 Tanger's Shop Pink Cards offer shoppers 25% off any item at participating stores, once per day, per store with unlimited use through October 31, 2018. Shop Pink Cards are available for $10, in two formats: a mobile card saved on your phone or a physical card to save in your wallet. Tanger's Shop Pink Cards can be purchased at any Tanger Outlets nationwide, online at www.tangeroutlet.com/pink or on Tanger's app. Individual centers will also host local PINK events, including 5K Walk/Runs, Pink Party Socials, and other Pink activations to enhance the shopping experience and to shine the light on breast cancer awareness. Proceeds from the campaign will support local breast cancer organizations as well as the Breast Cancer Research Foundation (BCRF), the nation's highest-rated breast cancer organization according to Charity Watch and Charity Navigator. Through BCRF, Tanger donations have directly supported pioneering studies in breast cancer, including research conducted by Dr. Kenneth Offit at Memorial Sloan Kettering Cancer Center, Dr. Katherine Nathanson at The University of Pennsylvania, and Drs. Elizabeth Jaffee and Leisha Emens at Johns Hopkins University. Since 1994, Tanger has contributed more than $17 million to breast cancer research through the PINK Campaign, 5K races, on-site events and other breast cancer-related fundraising initiatives across the U.S.
Tanger Factory Outlet Centers, Inc. (NYSE: SKT), is a publicly-traded REIT headquartered in Greensboro, North Carolina that presently operates and owns, or has an ownership interest in, a portfolio of 44 upscale outlet shopping centers. Tanger's operating properties are located in 22 states coast to coast and in Canada, totaling approximately 15.3 million square feet, leased to over 3,100 stores which are operated by more than 520 different brand name companies. The company has more than 37 years of experience in the outlet industry. Tanger Outlet Centers continue to attract more than 188 million shoppers annually. For more information on Tanger Outlet Centers, call 1-800-4TANGER or visit the Company's website at www.tangeroutlets.com.